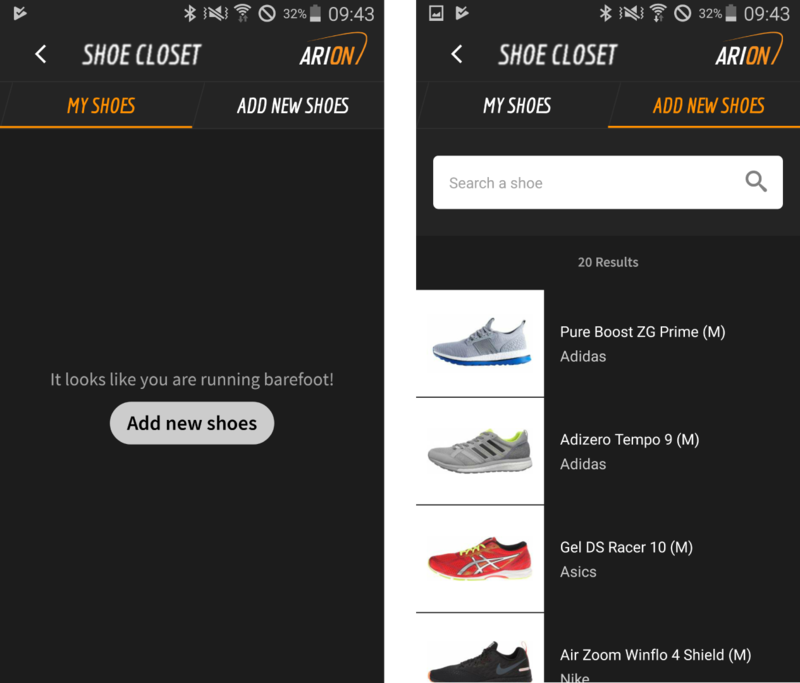 Go ahead and open the ARION app, and from there open the menu where you'll find 'Shoe Closet' in the list. The Shoe Closet has two tabs, one showing the shoes you have added to your closet (which is initially empty), and one for adding your shoes. If you head over to the 'Add new shoes' tab, you'll see a list of available shoes and a search bar to help you find yours. Simply enter the brand and/or model of the shoes here and you should find your specific shoes in the list. We have an extended database of running shoes available which is continuously updated. There is a male and female version available for every model. Note: Can't find your shoe in the list? Let us know and we'll add them to our database. When you find the brand and model of your running shoe, tap on it to see further details. Here you can set for example the color of your shoes, and whether they are brand new, slightly used, or heavily used. When you're happy with the settings, tap 'Add to my closet' to add them to your personal shoe closet. You can add as many shoes as you like to your shoe closet, so if you have multiple shoe pairs you can add them all here, ready to go for your future sessions. 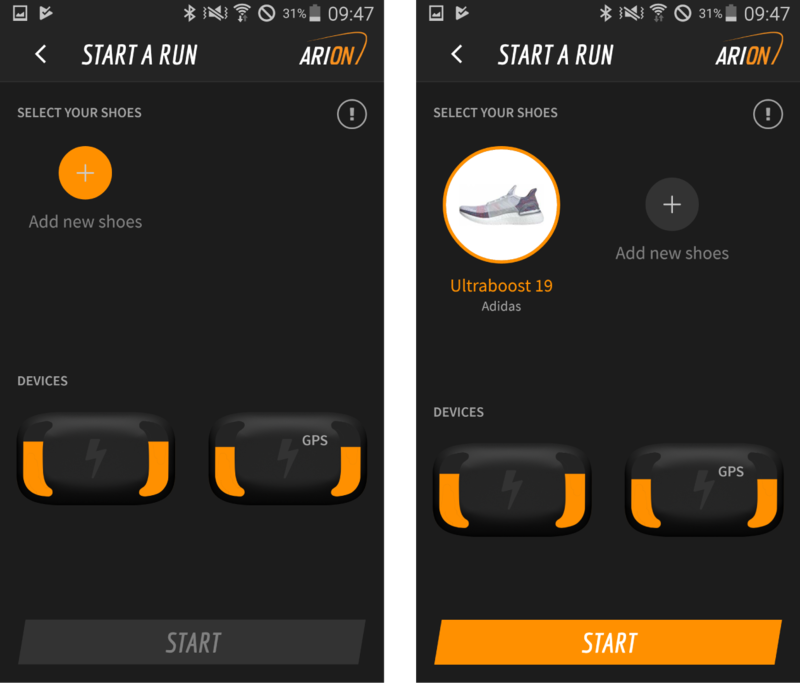 Now that you have added your shoes to your shoe closet, you can select which shoes you are going to use in your next running session. If there are no shoes in your closet yet, this screen will show an 'Add new shoes' button which will take you to your Shoe Closet. Please note that you need to select your shoes first before you can start a run. If you did add a shoe in your Shoe Closet, it will show up here. 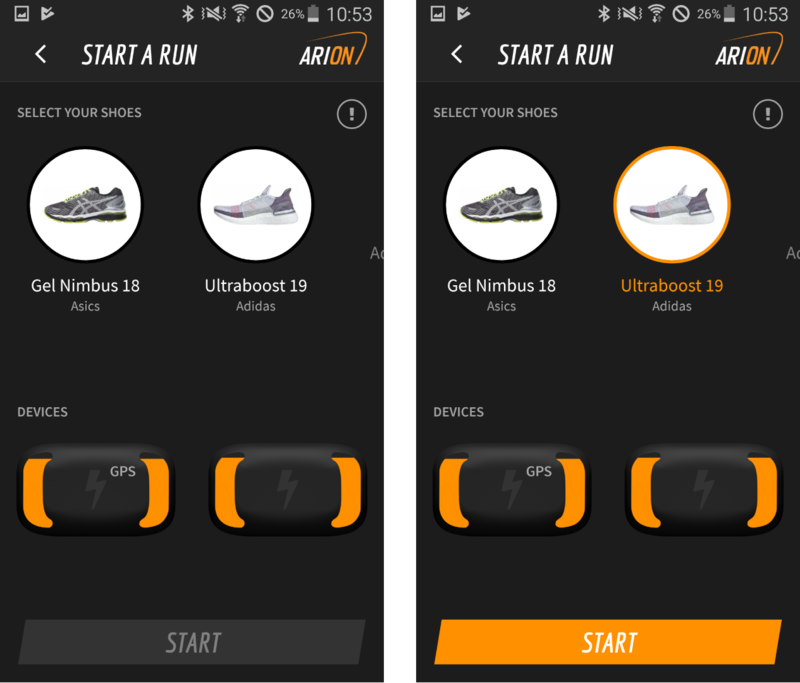 If there's only one shoe in your closet it will already be pre-selected and you can simply press 'start' to start off your run. Note: If there are multiple shoes in your shoe closet you need to select one first before you can press the Start button (see image below). 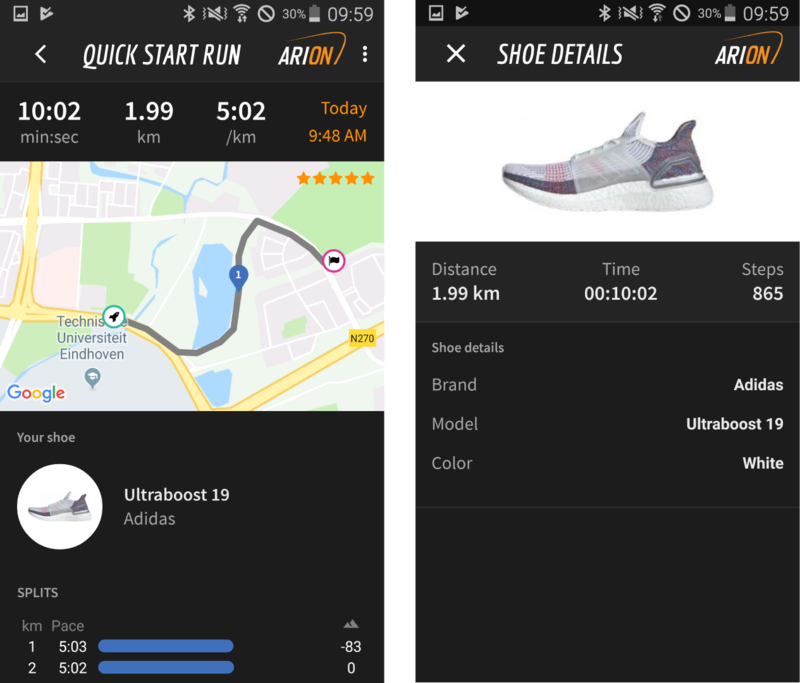 After your running session has ended, you will see the shoe that you used in the summary screen. You can tap on this shoe to see the the distance, time, and amount of steps that have been taken with this specific shoe. 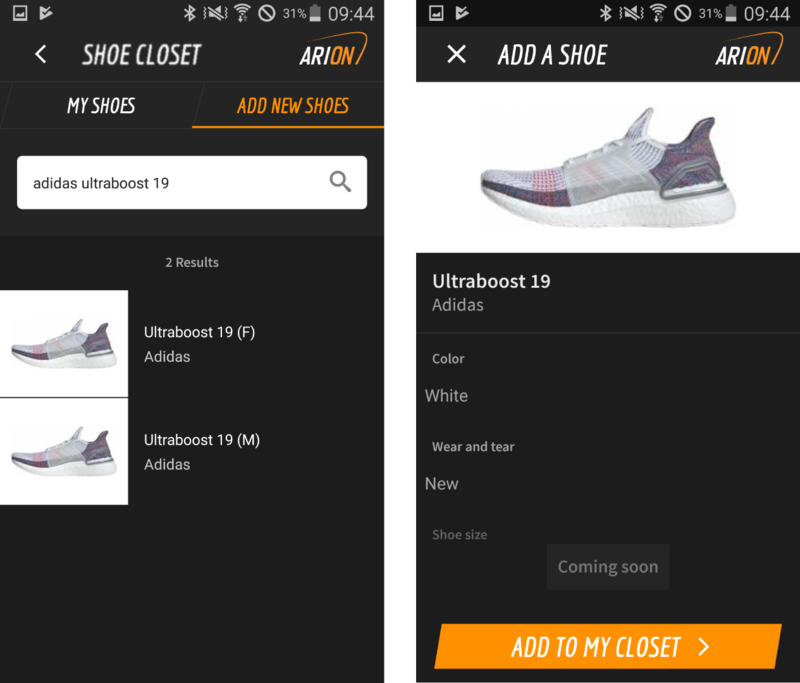 You can also find back the details of your shoes at any time by going into your Shoe Closet in the app menu and tapping on one of your shoes to find back the details.